Original Launch X431 Diagun III Legal Distriutor Launch X431 Diagun 3 Auto Scanner. X431 Diagun III is a new professional vehicle diagnostic tool designed and developed by LAUNCH for repair technicians. It's smart, easy to carry, fully functional and convenient to use, and it's the standard equipment for garage technicians. X431 Diagun III+Launch DBScar diagnostic adaptor integrated design,supports wired and Bluetooth wireless diagnosis.Color and touch inductive screen, easy operation. So buy this product and Save 22% OFF Launch X431 Diagun III Auto Scanner Now Only $666.00. 7'' 1280*800 CASKA Interchangeable Car DVD Player Android 4.4.2 OEM standard in-dash Suitable for all car models car GPS DVD. CASKA Android Pro,Professional Auto Android Solution,Operating System Android 4.4.2. Interchangeable Android Car DVD Player OEM standard System Suitable for All Car brands and models. 7 inches 1280*800 10 points multi-touch capacitive screens. Excellent Features:Airplay, Miracast, HDMI/MHL, SD/USB, 10 points multi-touch capacitive screens, Subwoofer Output, GPS, Bluetooth, Apps. OSD Languages: Chinese, Russian, Portuguese, German, French, English. Support Map: Kudo, Sygic, Garmin, TOMTOM, Route66, IGO. So buy this product and Save 23% OFF 7 inch 1280*800 CASKA Car DVD System Now Only $269.00. AUTEL MaxiTPMS TS501 TPMS diagnostic & service tool activate any known OEM/ Univeral TPMS sensors / Reprogram the vehicle�s ECU / Turn off the warning lights. The MaxiTPMS TS501 TPMS diagnostic & service tool is specially designed to activate any known OEM/ Univeral TPMS sensors, reprogram the vehicle�s ECU, and turn off the warning lights. So buy this Autel MaxiTPMS TS501 TPMS Car Tool Now Only $559.00. Launch Creader Professional CRP123 Original Auto Code Reader Scanner LAUNCH CRP 123 Internet Update. LAUNCH Creader Professional CRP123 Original Auto Code Reader Scanner OBDII/EOBD code reader supports all 10 modes of OBDII test for a complete diagnosis. It is truly the ultimate in power and affordability , allowing users to do their jobs faster. Graph, Record, Replay data and troubleshooter code tips help users to save diagnosis and repair time. So buy this and Save 30% OFF Launch Creader CRP123 Auto Code Reader Scanner Now $159.99. 100% Original LAUNCH X431 V (ScanPad 071) Professional Car Diagnostic Scan Tool Wifi / Bluetooth Full System X-431 Pro Diagnostic Tablet Free Online Update + Multi-Language. Launch X431 V (X431 Pro) with Bluetooth/Wifi based on Android system, is a new car malfunction diagnostic device developed by Launch Tech for internet application. X-431 V completely substitutes X431 IV and X431 Diagun III. It passes on Launch advantages in car fault diagnostic technology, such as vast car model coverage, powerful test function, special function and accurate tast data, etc., X-431 V achieves the full car model and full system fault diagnosis through the bluetoooth communication between DBSCar connector and intelligent mobile terminal. X-431 V taking the advantage of mobile internet, can share maintenance data and case library, provide instant maintenance information, and build public and private maintenance social circle,etc., thus lead to wide car diagnostic community. So buy this Launch X431 V Car Diagnostic Scan Tool Now $799.00. AUTEL MaxiDiag Elite MD802 4 system / All System + DS model + EPB + OIL Service Reset and support data stream function Engine + Transmission + ABS + Airbag + Major Electronic Models. Autel� new MaxiDiag Elite Series, the most advanced and multifunctional scan tools powered by its exclusive technology, are designed for technicians to troubleshoot either the basic four systems or all the systems for most of major vehicles on the road today. This new diagnostic platform delivers fast and easy diagnostics at the right price. And buy this Autel MaxiDiag Elite MD802 Auto Scanner at $229.99. Save 34% OFF Autel MaxiTPMS TS601 Auto Scanner. Original Launch Creader VII+ Auto Code Reader OBDII/EOBD Auto Scanner CReader 7 Plus Equal to CRP123 Function. Creader VII+ is a well built comprehensive diagnostic instrument by Launch. It's not only including the full function of OBDI I /EOBD, but also support more functions of four systems (Engine, automatic transmission, anti-lock braking system and airbag)of main car models, such as read and reset code, multi-languages, data stream graphic display, storage and playback of dynamic data stream, etc. So buy this Launch Creader VII+ Auto Code Reader Now $149.99. Autel MaxiCheck Pro Scan Tool ABS, SRS, TPMS, Oil Service, EPB, DPF , Steering Angle Sensor Calibration service reset. The MaxiCheck Pro specially designed for professional technicians and body shops to service individual specialized systems, such as ABS, SRS, TPMS, Oil Service, EPB, DPF , Steering Angle Sensor Calibration and more. So buy this Car Tools and Save 40% OFF Autel MaxiCheck Pro Car Scan Tool Now $259.00. CASKA X mirror All in One system 720P HD 5 inch LCD GPS Navigation + HD DVR + Rearview Mirror Camera + HDMI + Bluetooth/wifi Motion Impact Recorder with Dual Swivel Night Vision Cameras 140 large angle. Buy this product and Save 40% OFF CASKA X mirror System GPS Navigation + HD DVR + Rearview Mirror Camera Now $239.00. Autel MaxiTPMS TS401 new generation TPMS diagnostic and service tool unparalleled sensor coverage quick access to the faulty TPMS sensor. MaxiTPMS TS401 is a new generation TPMS diagnostic & service tool which features unparalleled sensor coverage and incredibly easy-to-use interface. This ergonomic tool provides you easy and quick access to the faulty TPMS sensor to help you increase customer satisfaction and boost your bottom line. So buy this Car Tools and Save 43% OFF Autel MaxiTPMS TS401 Auto Scanner Now $169.00. Ausdom� A261 HD Car Dash Cam DVR with GPS and 2 Inch View screen-Auto Dashboard Video Camera Recorder / Vehicle Camcorder Type Black box with G-Sensor for Auto-Recording. So buy this product and Save 45% OFF AUSDOM A261 Full HD 1080P Car DVR Video Recorder Now $109.99. Original Launch X431 V+ (X431 Pro3) ScanPad 101 Wifi/Bluetooth Global Version Full System Diagnostic Tablet X-431 V Plus Auto Scanner on Android OS. So buy this product and Save 49% OFF Off Launch X431 V Plus (X431 Pro3) Full System Diagnostic Tablet Now $999.00. Sitewide Free Shipping to United States!! 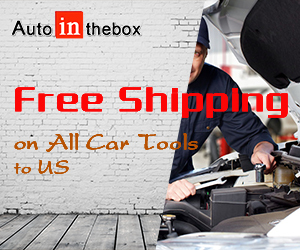 All Products Free Shipping to United States from Autointhebox.com. Shop Now. No Coupon Required. Autel MaxiSys Mini MS905 Automotive Diagnostic & Analysis System. The MaxiSys Mini has been developed for customers looking for a tool with ultra mobility and modern design while still delivering ultimate performance.Featuring a powerful A9 quad-core chip, beautiful 7.9� LED capacitive touch display, ultrafast wireless multitasking mobile operating system, combined with the most extensive coverage of OE-level diagnostics, the MaxiSys Mini is the ideal solution to manage your repair jobs in one mobile and smarter wireless tool. So buy this product and Save 27% OFF For Autel MaxiSys Mini MS905 Automotive Diagnostic & Analysis System Now $1,699.00. 100% Original Autel MaxiSYS MS908 Automotive Diagnostic & Analysis System with Blueooth VCI Module Free Online Update. Autel MaxiSys MY908 Scanner Automotive Diagnostic & Analysis System.Designed with the DNA of Autel�s diagnostics family, the MaxiSys is built to offer many of the prestigious qualities of the MaxiDAS DS708 with extreme ease of use and powerful diagnostic performance. However the MaxiSys has evolved far beyond the original capabilities. Utilizing an A9 quad-core 1.40GHz processor that offers 50% increase in speed versus competing products, a 9.7� LED screen with a resolution of 1,024 x 768 capacitive touch screen, the revolutionary multitask-capable Android Operating System, combined with the best possible coverage of OE-level diagnostics, the MaxiSys is the perfect diagnostic solution for shops and technicians who demand unrivalled smart technology and smart repairs. So buy this product and Save 36% OFF For Autel MaxiSYS MS908 Automotive Diagnostic & Analysis System Now $1,999.00. Autel MaxiSys Pro MS908P Wifi/Bluetooth OBD Full System Diagnostic and ECU Coding Programming System with J2534 ECU Preprogramming Box/VCI Model. Designed with the DNA of Autel�s diagnostics family, the MaxiSys is built to offer many of the prestigious qualities of the MaxiDAS DS708 with extreme ease of use and powerful diagnostic performance. However the MaxiSys has evolved far beyond the original capabilities. Utilizing an A9 quad-core 1.40GHz processor that offers 50% increase in speed versus competing products, a 9.7� LED screen with a resolution of 1,024 x 768 capacitive touch screen, the revolutionary multitask-capable Android Operating System, combined with the best possible coverage of OE-level diagnostics, the MaxiSys is the perfect diagnostic solution for shops and technicians who demand unrivalled smart technology and smart repairs. So buy this product and Save 42% OFF For Autel MaxiSYS Pro Full Functional Auto Diagnostic Tool Now $2,399.00.